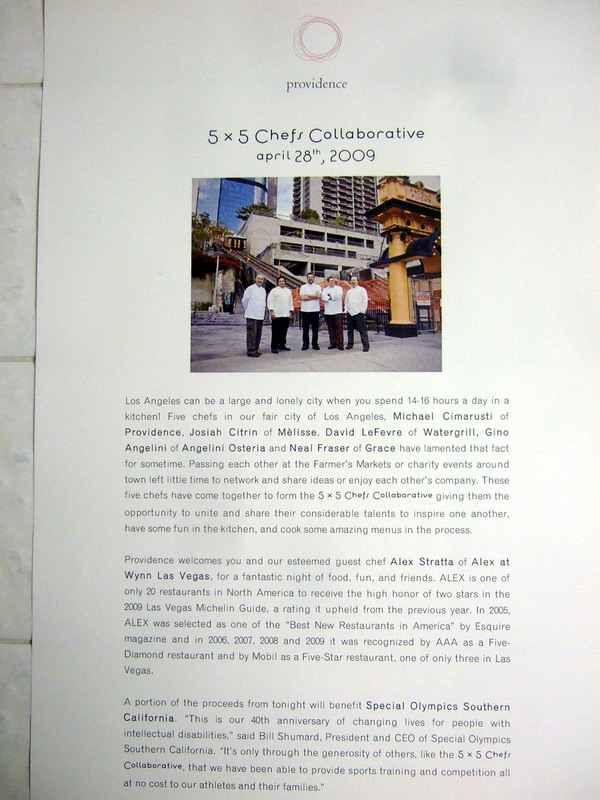 In each dinner, each of the five "core" chefs and one guest chef prepare one dish in a multi-course meal; in addition, the host restaurant's pastry chef is responsible for dessert. This year's fab five are: Gino Angelini (Angelini Osteria, Minestraio Trattoria), Michael Cimarusti (Providence), Josiah Citrin (Mélisse), Neal Fraser (Grace), and David LeFevre (Water Grill). Fraser replaces Walter Manzke, who was let go from Bastide last year prior to the beginning of the 2008 dinner series; Manzke is currently heading the kitchen over at Church & State. And just in case you were wondering, the inaugural group consisted of: Cimarusti, Citrin, and LeFevre, along with Angelo Auriana (Valentino) and Christophe Emé (Ortolan). Also present at this dinner were Brian and Will of FoodDigger, Danny of Kung Food Panda, Mike of Right Way to Eat, and Ryan of Only Eat What Feeds Your Soul. My original intent was to attend all five dinners this year, but unfortunately that won't be possible. 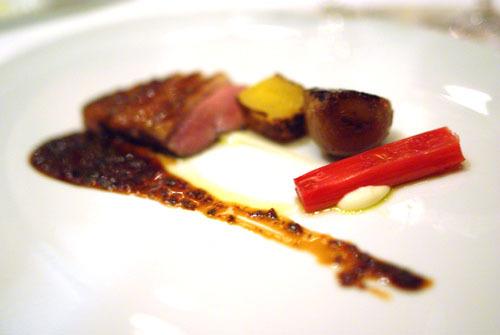 On May 17th, I plan on returning to Alinea in Chicago--the restaurant that started it all. 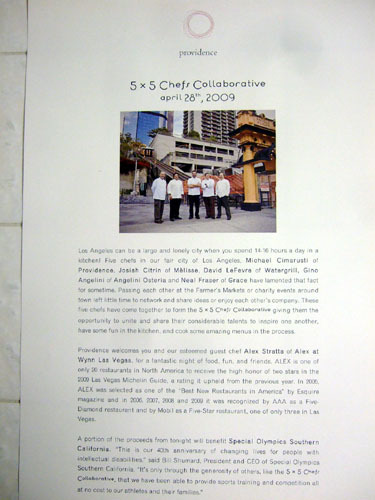 And on June 15th, I should be enjoying a 14-course "kaiseki" meal at Bar Charlie in Las Vegas. The last two 5x5 dinners are still open, however. 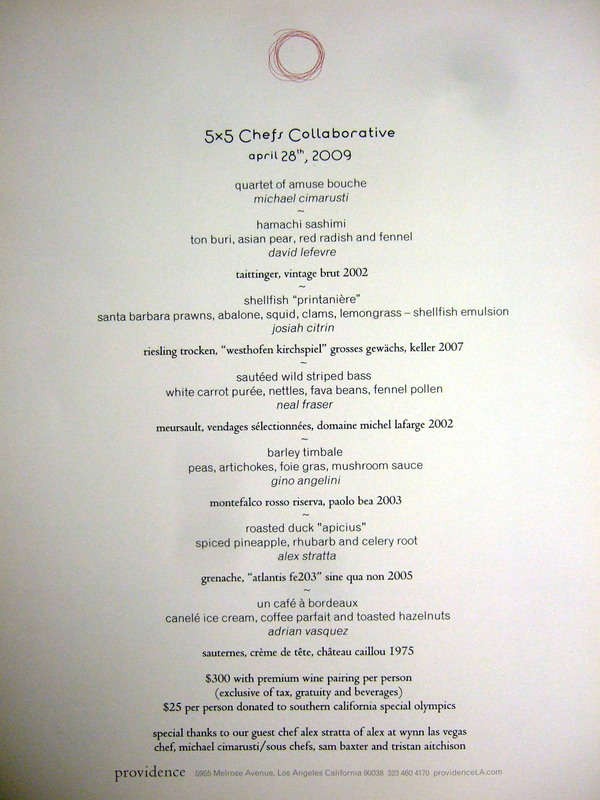 The seven-course 5x5 menu [$150] was the only menu option naturally, but we did have the choice of going with either a standard wine pairing [$65] or a premium version [$150]. 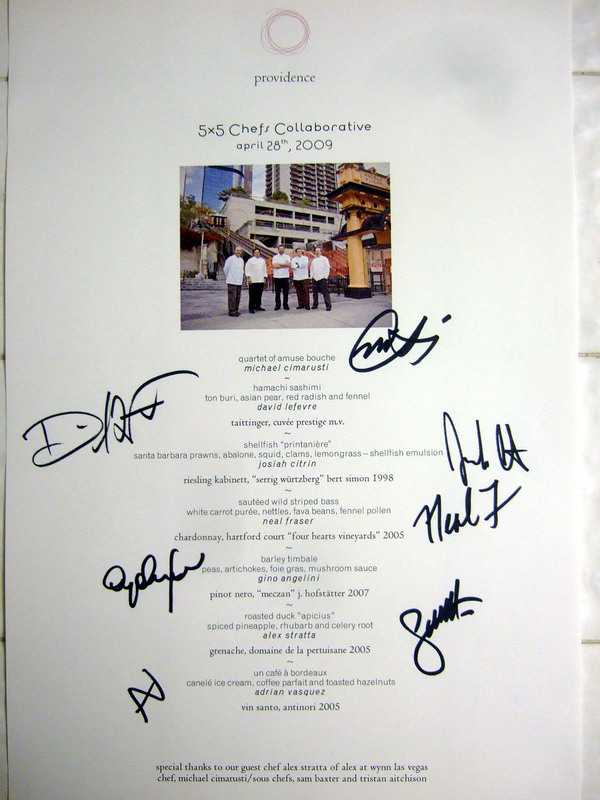 One of the things I look forward to is securing a menu signed by all seven chefs (FYI: in the photo, the chefs are at the base of the Angels Flight funicular railway near Bunker Hill in Downtown LA). Click for larger versions. 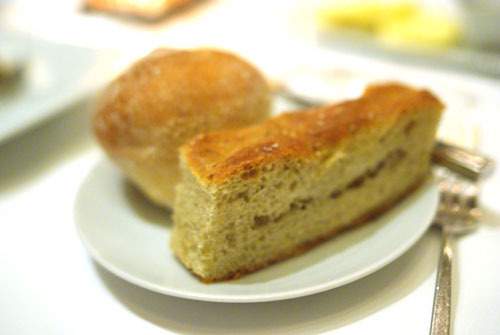 The two types of bread on offer were an olive focaccia and a plain roll. 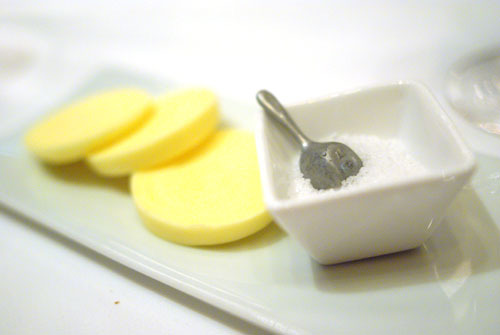 As always, in addition to lovely, subtly sweet pats of butter, salt was duly provided. We started with a selection of amuse bouches from Cimarusti. First was a sliver of Hokkaido scallop over a bed of Sriracha and mayonnaise, topped with crispy puffed rice. What made this bite was the rice, which had an almost popcorn-like savor. 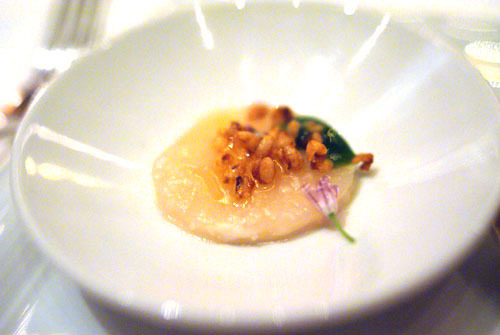 It complemented the sweetness of the scallop, and added a great textural contrast to the creamy mollusk as well. Next up, we had a dollop of uni over tomato. 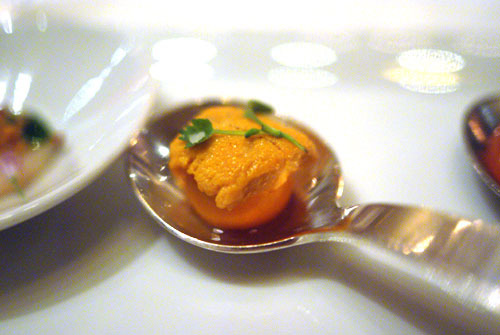 The sea urchin roe was subtly sweet and creamy as expected, but was deftly foiled by the tart, tangy tomato--quite nice. 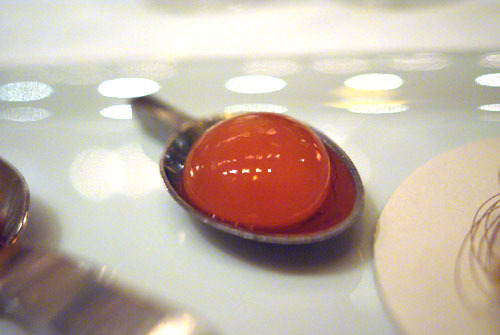 Third was a Greyhound cocktail spherification. A Greyhound is a vodka or gin based cocktail enhanced with grapefruit juice. I think that the essence of the drink was captured nicely here, with the sphere exploding in my mouth with an intensely grapefruit-y burst; very fun and refreshing. Finally, we were presented with Tasmanian sea trout over salmon skin, with soy sauce crème fraîche. The crisp, salty salmon skin was an excellent contrast to the mild, creamy trout--absolutely lovely. Overall, this was a superb way to kick things off. Sashimi is always a fitting start to a meal. The hamachi here had a great texture: tender, not too fatty, with a mild, slightly savory flavor. It came topped with tonburi, the dried seed of the cypress tree, which gave the fish a lovely, salty zing; the yellowtail was further heightened by the tart crème fraîche and radish sauce. 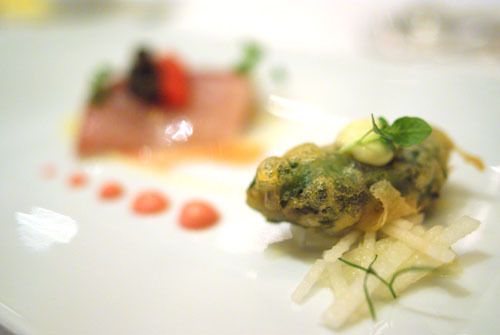 The hamachi was paired with a Dungeness crab and shiso tempura, over Asian pear. The crab's natural sweetness was a great counterpart to the mintiness of the shiso, while that sweetness was further accentuated by the pear. Interestingly, the wine pairing, the Taittinger, was the exactly same wine we started off with last year. 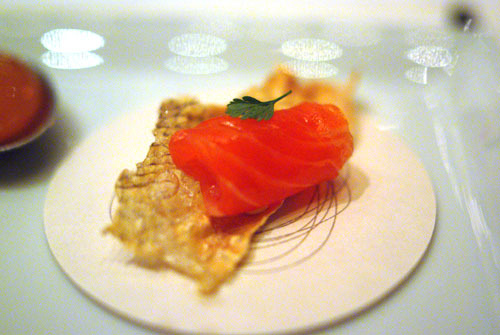 Really a quintessential expression of the style, its crisp, dry flavor was a superb complement to the sashimi. The idea behind this dish was to celebrate the arrival of spring--a lofty goal, but I think Citrin did an admirable job. Rather than simply melding into a homogeneous mélange of sorts, every element here made its unique presence felt. I was able to experience different tastes and textures in each bite, and the briny, ocean-y smack of the seafood was elevated even further by the tangy emulsion of lemongrass, as well as the subtly sour sorrel panna cotta. The course was paired with a Riesling Kabinett, which was actually less fruity and grassier than I'd anticipated. It also had a blunt acidity that actually went well with the food; a sharp acidity would've overwhelmed the delicate flavor of the shellfish. Here, I really enjoyed the fish's soft, flaky texture in concert with its rich, fatty flavor, intensified by the savory skin (which could've been a touch crisper). The bass would've been too monolithic on its own, so fortunately it was paired with the nettle, which provided a slightly bitter flavor contrast. The favas, meanwhile, gave the dish a fantastic crunch. Although I wasn't a huge fan of the Chardonnay initially, at first finding its grassy minerality overpowering, the fish really tempered it, bringing out the fruit flavors I was looking for, providing for a better, more multifaceted wine. When eating this, I immediately thought of the sault farrow dish (L'Epeautre) I had at Joël Robuchon. It was really the texture that stood out here: slightly hard, chewy, yet yielding. 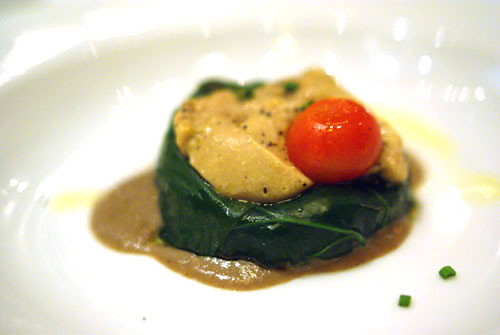 Think of it as barley risotto wrapped in spinach and topped with foie gras, tomato, and porcini sauce. The barley had a rich, heavy flavor with a touch of sweetness; had it not been for the astringency of the spinach and tartness of the tomato, it would've been too overwhelming. The foie gras was interesting as well; it started out very mild, but its flavor got progressively stronger on the finish; in any case, it was one of the best hot preparations of foie I'd had in a while. The wine here, an Italian Pinot Noir basically, showed nice dark berry flavors with a bit of spice and acidity--it was light, but powerful enough to stand up to the dish. 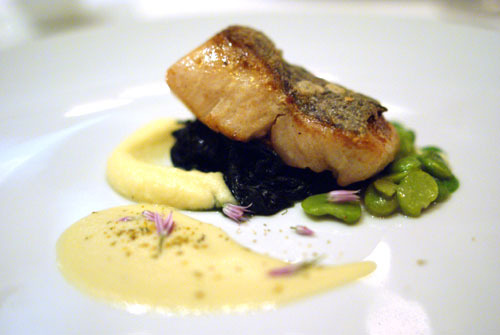 Our final savory, this course pays homage to Marcus Gavius Apicius, a legendary Roman gourmand. 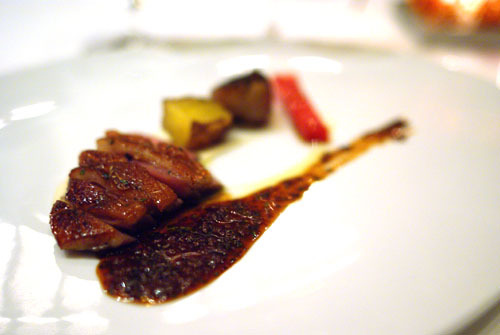 Apicius is known for his use of seasonings made with wine, vinegar, honey, and spices, hence this roasted duck with shellfish glaze, herbs, and red wine vinegar reduction. While the bird itself was tasty, somewhat like a Chinese roast duck, its accoutrements resulted in the whole amalgam being a bit too sweet and spicy, overpowering the natural flavor of the duck. The pineapple especially was too severe, though I really enjoyed the celeriac. This intense bird needed an equally intense wine, and the Grenache was well up to the task. Apparently made from the fruit of 98-year old vines, the Pertuisane put forth a spicy, herbal, fruity profile that really stood up to the duck. A Bordeaux specialty, the canelé is a type of small French pastry traditionally made from egg, milk, and flour. 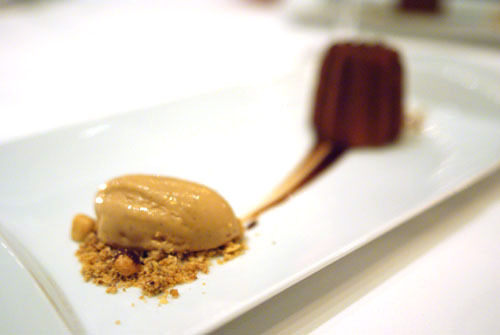 Now, instead of just a mere canelé, Vasquez fills his "canelé" cake with a cold liquid café au lait center, and moves the canelé's rum-vanilla flavor to the ice cream. To top it off, he tosses in hazelnuts and barley, giving the dessert a wonderfully nutty finish. The interplay of textures and tastes was simply fantastic, and I wasn't surprised to hear that the dish had become part of Providence's regular dessert menu. The wine we had here was a Vin Santo, a type of Italian dessert wine from Tuscany made with Trebbiano and Malvasia grapes. 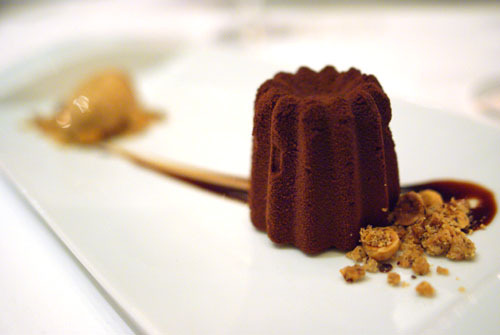 Its flavor was not unlike that of sherry, with a dryness and nuttiness that balanced the sweetness of the dessert. There is a restaurant in Los Angeles called Canelé, and as an aside, I asked Chef Cimarusti, who was at the table during dessert, what he thought of the place. He responded that he visited when the restaurant first opened, and thought that it provided good, simple food. Apparently, Canelé is also the favorite restaurant of blogger Mattatouille. 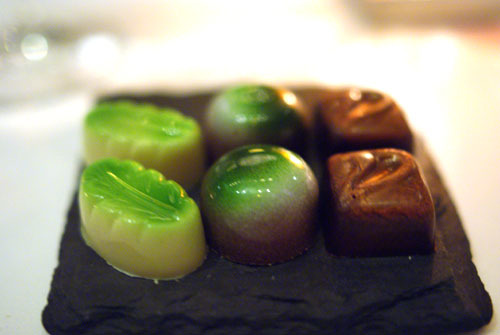 With the meal nearly over with, we were brought a two small plates of house-made candies. Left to right, they were: white chocolate with kalamansi and mint (a nice interaction between sweet, sour, and minty); milk chocolate with coconut green tea (my favorite); and dark chocolate with coffee and erfah (a typical coffee and chocolate pairing). 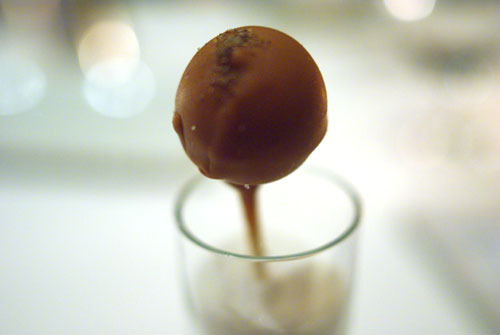 After the first serving of candies, we asked for Providence's infamous lollipops. Unfortunately, they only had three left. Since I'd never had one before, I was allowed one of the milk chocolate lollys topped with cardamom. It wasn't what I expected; I was picturing an ice cream-like center (à la Michael Mina), but instead, upon mastication, I got a bracing burst of passion fruit liquid that coated my mouth! One of my dining companions found the sensation rather disconcerting. 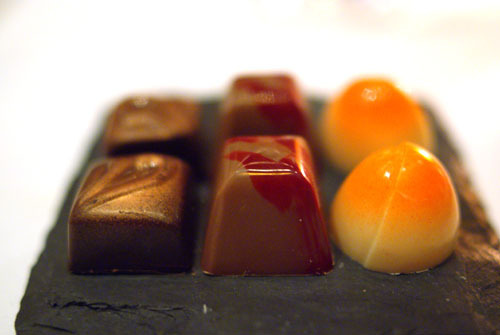 To compensate those that didn't get the lollipop experience, another plate of chocolates were given, this time: dark chocolate with coffee and erfah once again; white chocolate with hazelnut and jelly; and apricot and saffron. The 5x5's just keep getting better. Compared to last year's event at Providence, the dishes seemed to be stronger on average, and the meal as a whole was more balanced, more cohesive. 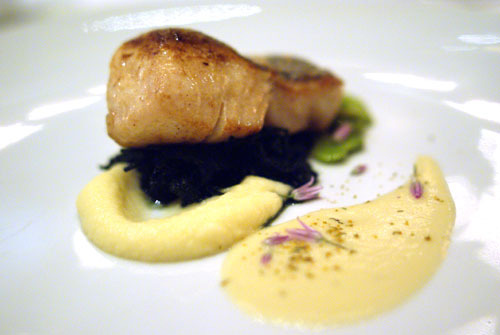 However, at the same time, the dishes still showed off the differences in style, flair, and approach among the chefs. I'm already looking forward to next year! Oh em gee! I am seething with jealousy! Your photos are so beautiful, Kevin! will u be try the other Charlie Trotter's restaurant -- Restaurant Charlie at the same time. If yes try to ask for the skyloft, with some advance they will able to combine the 14 course tasting together. (it come to 24 course ~ $400, some kaiseki dish been combine into bento box). Sharon: Thanks! The photos were a huge improvement compared to what my P&S was giving me previously. dhkm: Unfortunately I'll only have time to try out Bar Charlie. However, I may try to augment the meal with some courses from Restaurant Charlie. I like the idea of the Skyloft though--I guess I'll save it for next time. I don't expect Chef Trotter to be there, but I'll say hi for you if he is! Fantastic! 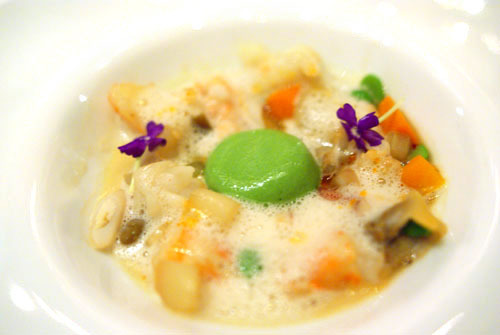 I wonder if Citrin is currently serving the shellfish "printanière" at Mélisse? Good to see you are coming to Vegas again. May I recommend Raku if you have the time as well. Interestingly, we went to BC last weekend. A manager for Palazzo told us that BC & Restaurant are not doing well. Apparently, Palazzo already has another chef lined up to take over. Hopefully it is still open when you come. Cheers, Henry. Ah, maybe I wasn't over Prov D after all. I have too many expenses coming up to drop $150 now, even if it is for a good cause. From your review, it does seem to be much more cohesive than last year. This is going to be a strong 5x5 season. I've never seen a chef use Sriracha, especially with a scallop. I'd imagine the flavor would be overwhelming. Aaron: So any plans to check out the future 5x5 events? The Sriracha was actually very light, tempered by the mayo I imagine. the photos are divine. descriptive and mouth-watering report! 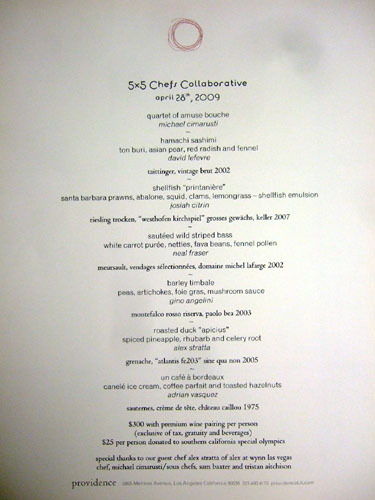 This post got me to cave on the 2009 5x5...we as going to do Angelini Osteria with Chef Bartolotta, my husband's fave. You are a wicked, wicked man. In any case, I may see you guys at Angelini! My new favorite foodie page. 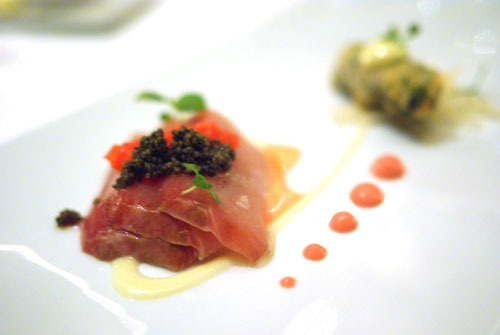 I mean, REALLY, you have actual photos (and great ones, nonetheless) paired with well-informed (not-to-mention, truly sumptuous) ruminations on myriad dishes -- two containing BOTH the words *sorrel* AND *timbale*!